Monday, June 5th 2017. The trial of the Saharawi political prisoners of the Gdeim Izik group opened before the Court of Appeal in Salé – Morocco. activists for the independence of Western Sahara and Human rights defenders , but also the lawyers by their absence protest against this unfair trial whose first hearings were held on March 13th 2017 after months of postponements. On June 6th, in the space authorized for the Saharawi demonstrations, surrounded by the hubbub of Moroccan sound systems friends of Sid Ahmed Lamjayed sentenced to life imprisonment expressed their support and demands, among 80 other demonstrators. 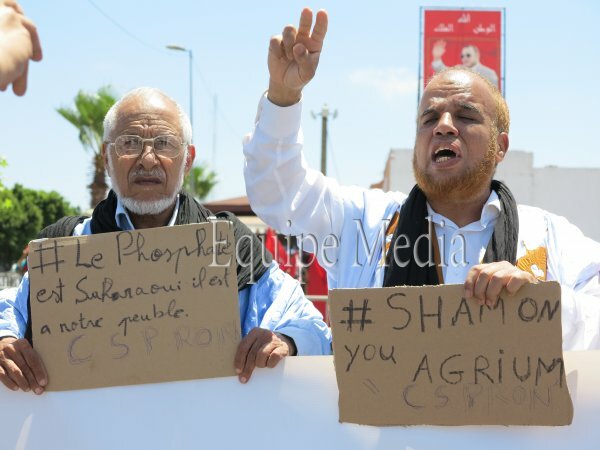 On the panels we could read “Agrium shame on you”, “The phosphate is Sahrawi, and it belongs to our people”. This entry was posted in General, Human Rights, Phosphate importation, Political issues on July 1, 2017 by appleton. A panel of judges in South Africa ruled today that the detention of NM Cherry Blossom on 1 May 2017 was correct. 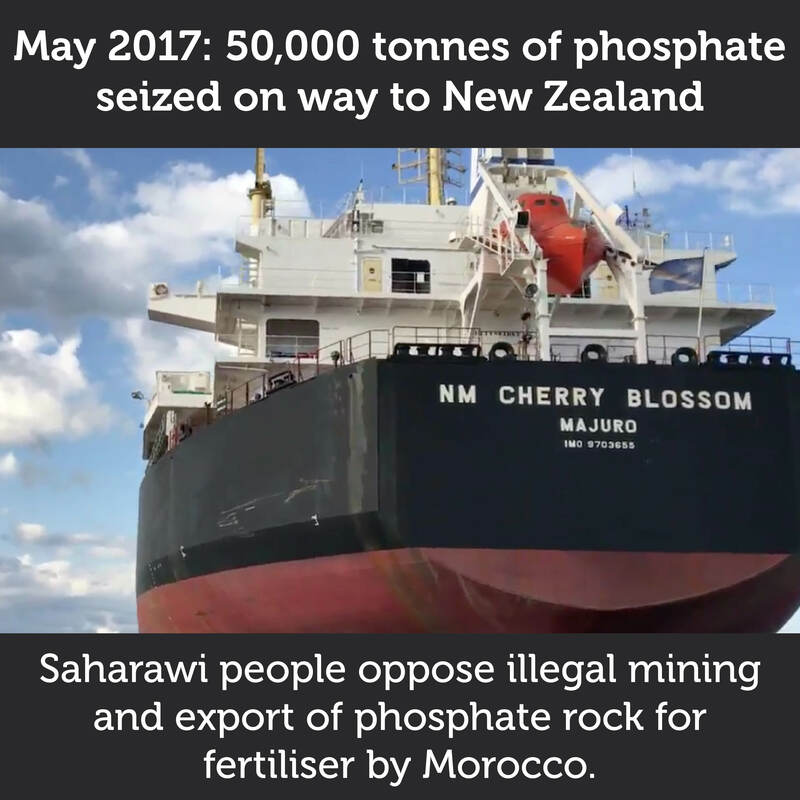 The Western Sahara people has thus passed the first hurdle in the legal process to win ownership over a cargo of phosphate rock that Morocco has tried to export from the territory that it holds under occupation. “The ICJ’s judgement is clear: Morocco has no claim to sovereignty over Western Sahara. Its claim as result of its occupation of the territory is incompatible with the status of Western Sahara as a non-self-governing territory. Furthermore, it acquired control of the territory by force. This, as a means of acquiring sovereignty, is contrary to customary international law”, the judges stated. 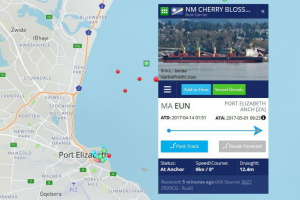 A panel of judges in the High Court in Port Elizabeth, South Africa, judged this morning that the cargo on board the vessel NM Cherry Blossom is rightfully detained, and that a trial to determine its ownership is to take place. The court decided that the sheriff is “directed and authorised to remove the ship’s registration documents and trading certificates” until the case is settled. This entry was posted in Human Rights, Phosphate importation, Political issues on June 17, 2017 by appleton. Bir Lehlu, Western Sahara (June 15, 2017). 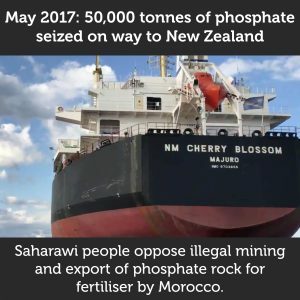 On May 1 the government of the Saharawi Arab Democratic Republic (the SADR) and the Saharawi national liberation movement, the Polisario Front, obtained a civil court order to detain a cargo of phosphate mineral rock transiting through South Africa, illegally exported from occupied Western Sahara in April. The 54,000 metric tonnes cargo, purchased by the New Zealand fertilizer company Ballance Agri-Nutrients Limited, has a value estimated at more than $7 million (NZD). After 45 days, the cargo remains under detention aboard the Marshall Islands registered bulk carrier NM Cherry Blossom at anchor in Port Elizabeth. Today the High Court of South Africa issued a decision on a review of the May 1 order to detain the cargo. This procedural step was routine in South Africa’s civil justice system. The Court confirmed the correctness of the May 1 order, that it had been obtained on proper grounds. The civil lawsuit will now go to a trial on the question of ownership rights to the cargo. Over the years, virtually every phosphate purchasing company had been warned of the risks of importing the commodity, including that ownership rights to it could not be transferred because of the illegal occupation of Western Sahara. 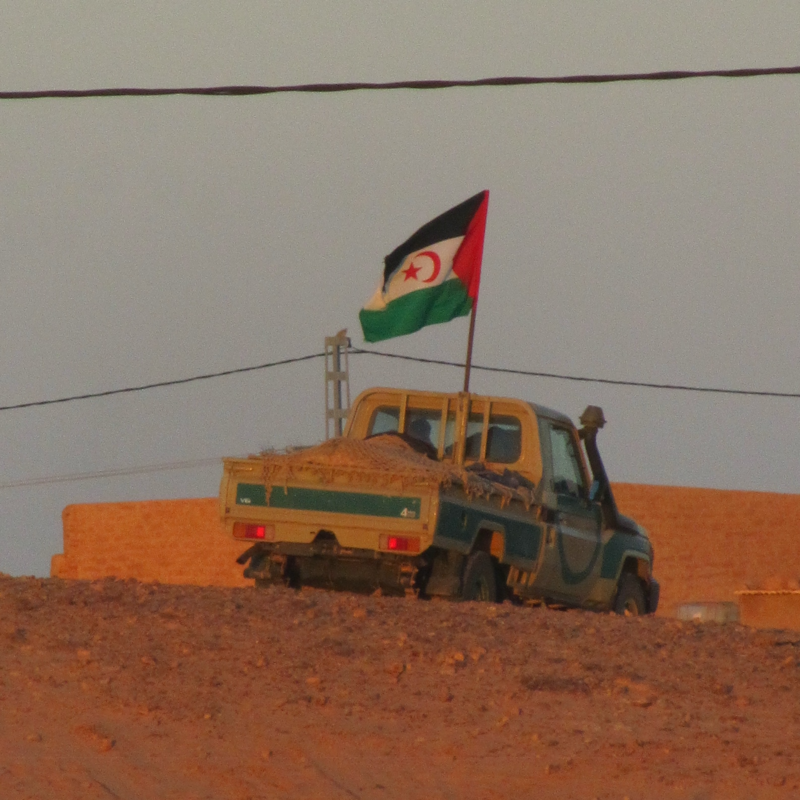 Can the EU answer these questions on Western Sahara trade talks? Above: The tank vessel Key Bay seen in the harbor of El Aaiun on 6 January 2017 – the first confirmed transport of goods from Western Sahara into the EU after the landmark judgment of the CJEU. 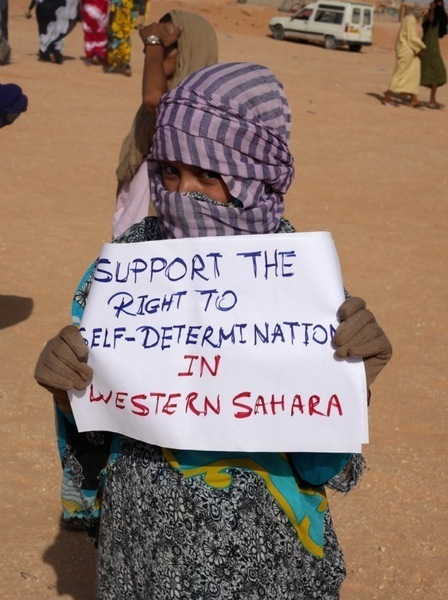 On 21 December 2016, the Court of Justice of the EU (CJEU) judged that EU-Morocco trade deals cannot include the territory of Western Sahara. This entry was posted in Fisheries exploitation, General, Human Rights, Oil and gas exploration, Phosphate importation, Political issues on June 3, 2017 by appleton. The detention of a vessel carrying a cargo of phosphate rock destined for Canada from occupied Western Sahara. Bir Lehlu, Western Sahara (18 May 2017). 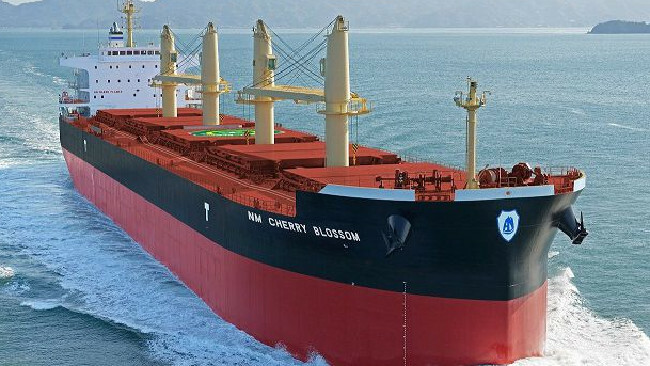 The government of the Saharawi Arab Democratic Republic (the SADR) and the Saharawi national liberation movement, the Polisario Front, announced today the detention of a second vessel carrying a cargo of phosphate rock illegally mined and sold from occupied Western Sahara. The motor vessel Ultra Innovation, was detained last night in Panama under court order while transiting the Panama Canal en route to Canada. This entry was posted in Human Rights, Phosphate importation, Political issues on June 3, 2017 by appleton. in the eyes of the good shepherd. will you be able to buy them. So go the first lines of a poem by Fatma Brahim, who composed the work in 1976 as she and her daughters left the destroyed refugee camp of Um Dreiga, Western Sahara, after the Moroccan air force napalmed it. The poem, titled “Sahara is not for sale,” has become a classic revolutionary song for Saharawis, who are still pursuing their struggle for independence. It succinctly draws attention to a central aspect of the Western Sahara conflict, and an increasingly key demand made by Saharawi pro-independence activists: natural resources. This entry was posted in General, Human Rights, Phosphate importation, Political issues on May 14, 2017 by appleton. The Cherry Blossom’s cargo is being fought over in South Africa by lawyers. RABAT/ALGIERS, A Moroccan phosphate ship has been held in a South African port by a complaint from Western Sahara Polisario movement that it transported cargo unlawfully from the disputed territory, a lawyer and Polisario said on Wednesday. This entry was posted in General, Human Rights, Phosphate importation, Political issues on May 13, 2017 by appleton.